↑ Juha Janhunen (2006). 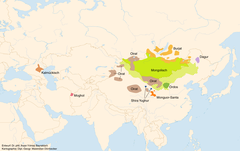 The Mongolic Languages. Routledge, 393. ISBN 978-1-135-79690-7. ↑ (2013) "Mongolic", Glottolog. Leipzig: Max Planck Institute for Evolutionary Anthropology.